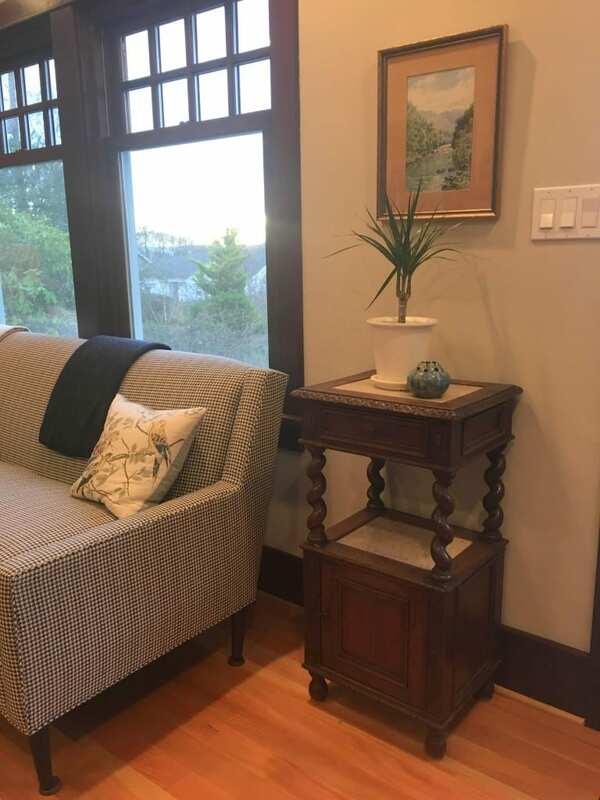 Our creative customer Sarah K, in Seattle, WA, bought an antique French Hunting nightstand from us, but she had other plans for this lovely piece rather than put it in the bedroom. Sarah placed the French Renaissance Hunting style nightstand in her living room and we think that’s a great idea. When Sarah sent us these photos of the nightstand in her home, she said, “We love it!” We do too! 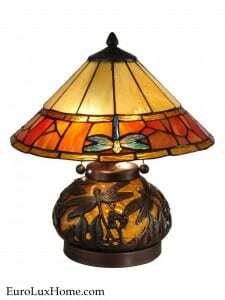 An antique nightstand or bedside table works beautifully as an end table, side table or accent table or as a hall table or plant stand. The cupboard provides storage and the drawer also gives you space to slip small items like coasters or perhaps your remote controls. The two levels offer plenty of space for your bedtime reading and other nighttime necessities, but if you are not using the cabinet in the bedroom then that shelf provides space for a stack of magazines or to display a pretty bowl or small collectibles. This photo shows more of Sarah’s elegant living room. I love how she ties the room together with blue and green in the sofa, blanket, pillow, painting, house plant, and also that little decorative blue bowl! This angle also shows off the decorative appeal of the barley twists on the nightstand. They give a structural look that is quite noble. The lower cabinet is framed with carved swirls and the cupboard door is accented by a square panel. This gives the full gorgeous effect from the other direction! 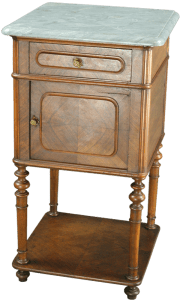 We actually have a similar antique French Hunting nightstand in the store at time of writing, so if you are interested in snapping it up for yourself, get in touch soon and ask for item number 18-16! 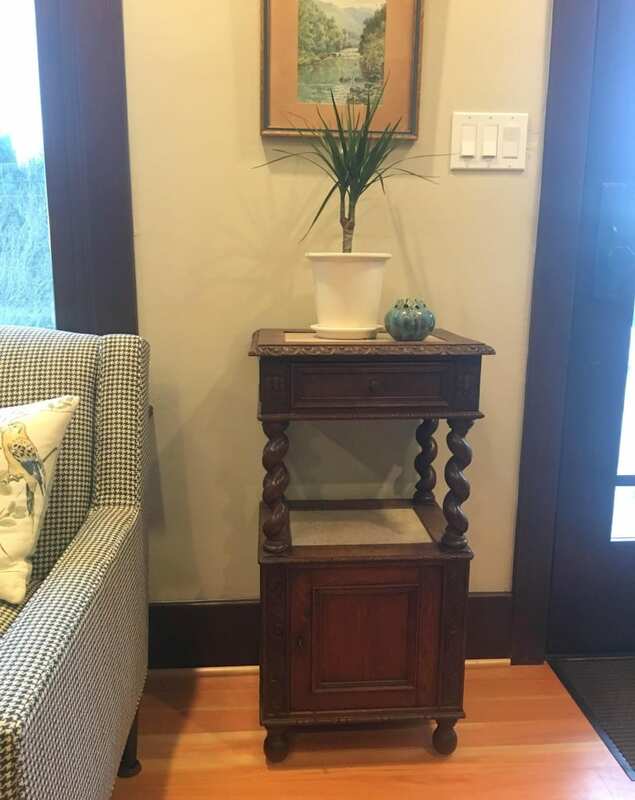 Sarah is not the only customer who took a creative approach to her antique nightstand. Our customer Kathleen G. in Arcadia, OK, uses her Henry II nightstand in the kitchen. 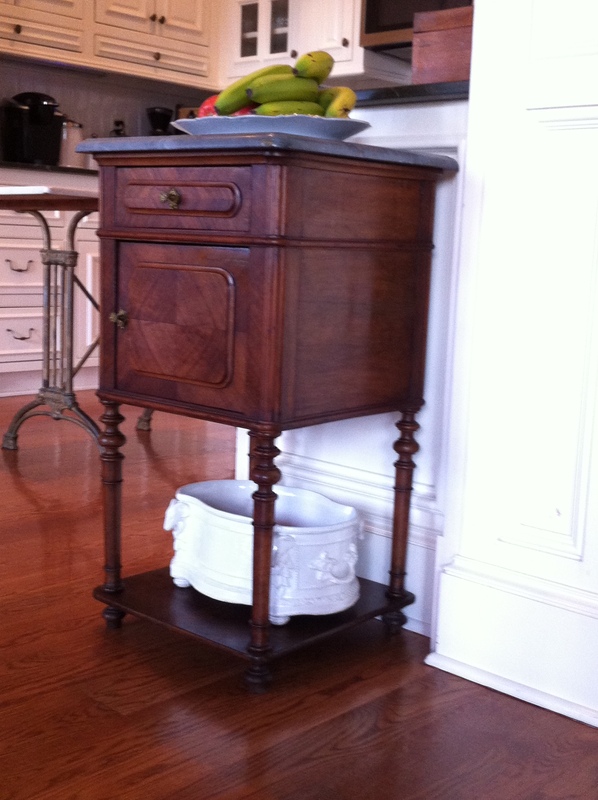 You can see how well that works in our blog post Creative New Use for Antique Nightstand. Thank you Sarah for sending photos of your lovely home and we hope you enjoy using the antique French Hunting nightstand for many years. 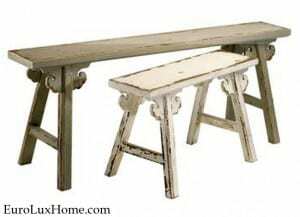 This entry was posted in Client Spotlight and tagged antique French furniture, antique nightstand, creative home decorating, Hunting Style, interior decor, living room decor, living with antiques on October 24, 2017 by admin. 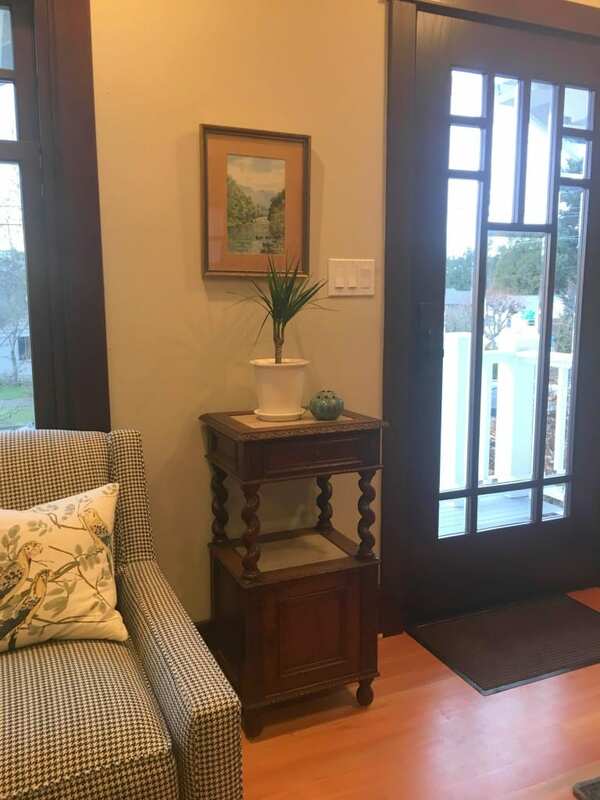 I love it when I see how creatively some of our customers use and display the antique furniture they buy from us. Our client Kathleen G. in in Arcadia, OK, is a great example! 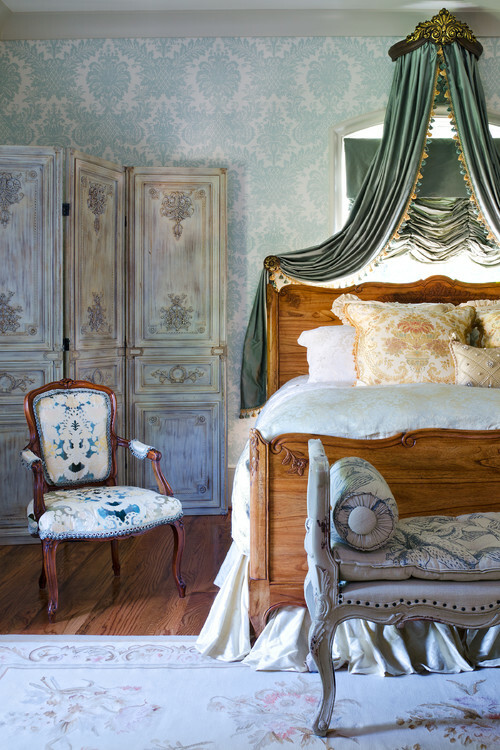 Kathleen purchased this French antique nightstand in the Henry II style and dating to 1900. The geometric walnut marquetry and lovely turned legs are nicely set off by the gray marble top. We suggested that the antique nightstand could be used not just as a bedside table, but also as an accent table in the living room or hallway. It would even look pretty in a powder room. 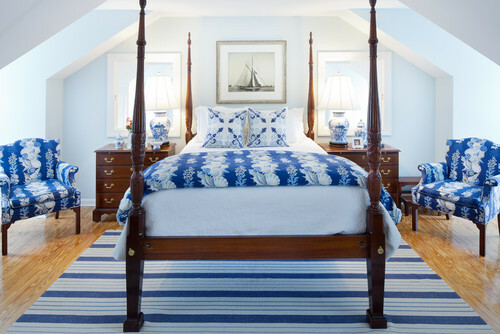 Kathleen went one better, and used the antique nightstand in an even more interesting way! 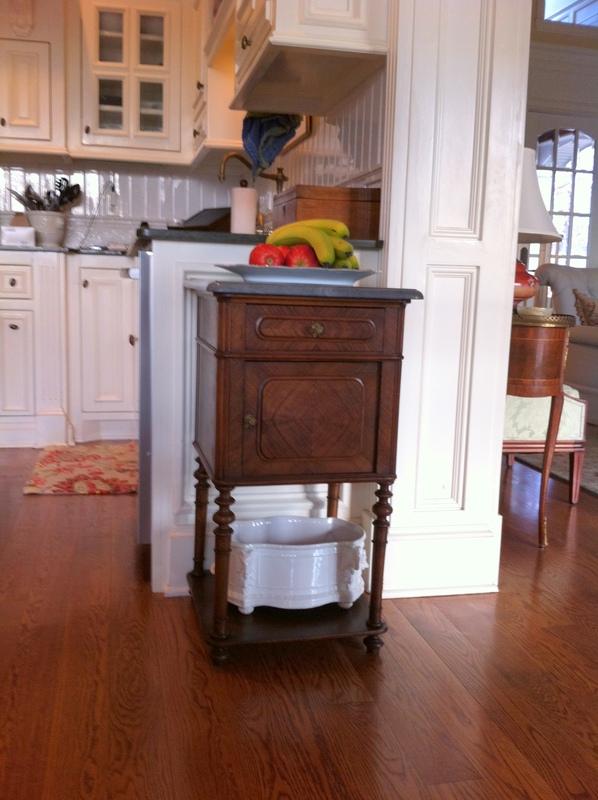 Kathleen is using the antique nightstand in her kitchen as a table with additional storage. 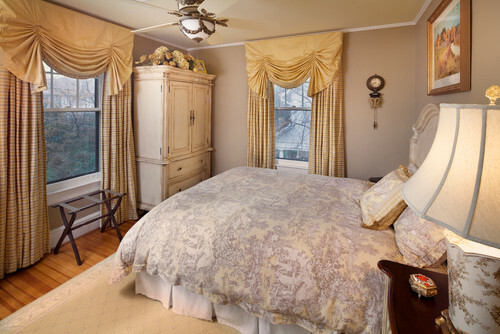 It looks terrific against the wood floor and blends beautifully with Kathleen’s French Country style paneled cabinets. This close-up gives you another view of how the antique nightstand looks in its new role as a kitchen cabinet. It’s such an interesting conversation piece. Inspired by Kathleen’s creative decor, I found a couple more examples of how people use antique furniture in unusual ways. 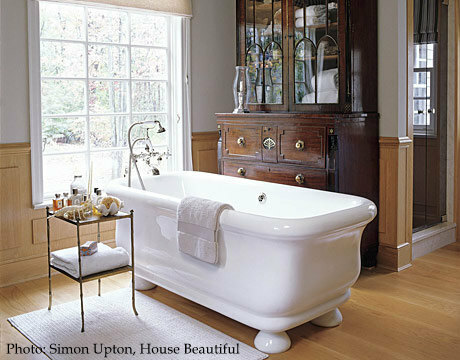 A House Beautiful magazine article showed this master bathroom designed by Paolo Moschino with a 19th-century antique English secretary. The secretary provides a lot of storage for towels and grooming products. It also looks gorgeous beside the old-fashioned tub, although I’d want good ventilation in the room in case it got too steamy and wet! 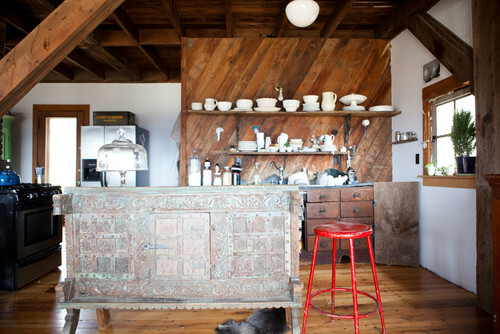 An antique Tibetan altar serves as a kitchen island in this Vermont barn house kitchen. The worn finish of the altar looks beautiful against the rustic wood floor and walls. I am sure that if they use the island to chop food they have a good chopping board on top. The altar is a unique and decorative storage space and room divider, and a nice island to gather around for coffee! We’d love to hear from you if you’ve found a creative new use for antique or vintage furniture. Tell us in the comments box below. This entry was posted in Antique Furniture, Client Spotlight, Home Design Ideas and tagged antique French furniture, Antique Furniture, Antique Henry II nightstand, antique nightstand, antique secretaire, home decor, how to blend antiques into decor, interior decor, interior design, living with antiques, Repurpose Antique Furniture, Repurpose Antiques on May 21, 2014 by admin.